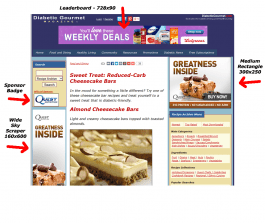 Diabetic Gourmet Magazine provides an audience of people highly motivated to find low-carb and sugar-free foods, diabetes health-related products, and diabetes-related services — and Diabetic Gourmet Magazine Sponsorship offers a premium advertising package for premium brands. Diabetic Gourmet Magazine provides an ideal way to reach a targeted audience of people living with diabetes. It also provides an audience that is almost 80% women (see “Reaching Women” to the right to see why this is a good thing). This convenient, all-inclusive sponsorship program provides high Share-of-Voice to each sponsor and includes the most popular ad types as well as beyond the banner, out-of-the-box campaign components. Promotional components include email advertising, banner advertising, content integration, giveaway/contest sponsorship (with lead generation), text links, social media exposure and more. Suprisingly easy to setup and get running! Long-term exposure to a highly targeted audience of people living with diabetes. Extensive variety of ad types and promotional methods provides a fun, multi-faceted approach. High Share of Voice – You will reach our readers every day. Great branding. Your brand will be seen in a trusted resource. You know exactly where your brand appears and who is seeing it. Unlike some ad networks and bulk ad buys, you will not be associated with, or promoted alongside, suspect products or inappropriate content. Creates brand awareness and word-of-mouth buzz. We only offer a limited number of sponsorships per year. Sponsors must be approved by our editorial team. Exclusive sponsorships are also available – which means you’re the only sponsor brand for a specific product type.